Simply Pam: Super Fun Birthday Project & Giveaway - Day 1 w/ Janis! 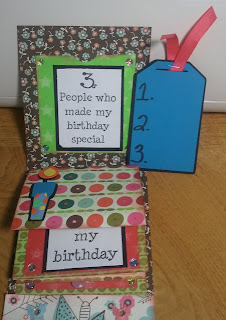 Super Fun Birthday Project & Giveaway - Day 1 w/ Janis! First can I say I just love my Birthday Button my friend Glora's husband made for my blog. Isn't it the cutest? That is one of my favorite pictures of my little girl dog Kyla. Love it. Thanks Ryan! 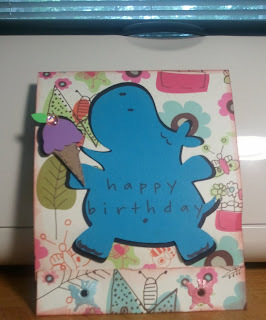 Here is her project she made for my blog. 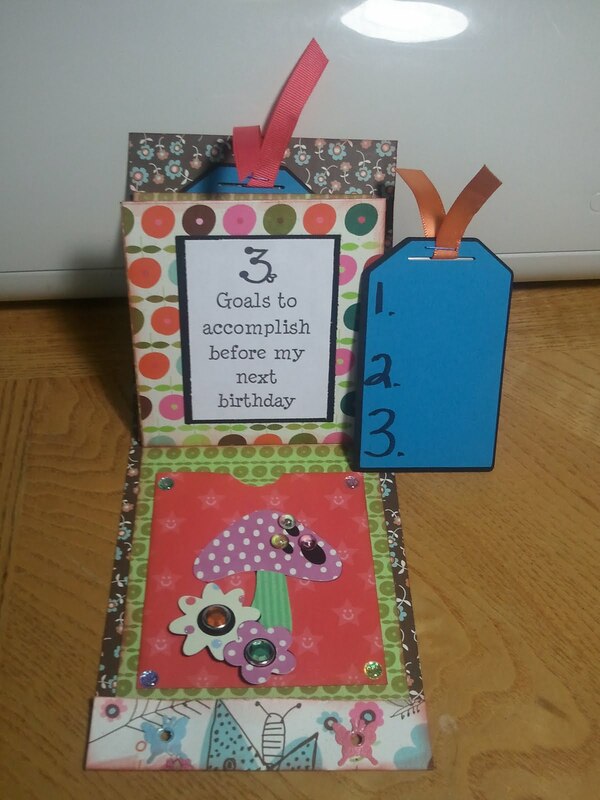 She made a matchbook mini album and it is SO cute!!! Make sure you head on over to her blog for instructions on this project and to see more pictures on the detail of this super fun mini album. She is also giving away this mini album to one lucky winner. Just leave a message on her post on her blog. To be eligible to win leave one comment on this post with a way to get a hold of you. You don't have to be a follower of my blog to win but I won't kick you out if you are. :) You have until Sunday, July 17th, 6pm MT to leave a comment be eligible to win. ~ Thanks for stopping by and a BIG THANK YOU TO JANIS! Wow, this project is super cute, she did a great job on it. Happy Birthday week to you Pam. I hope you have a SIMPLY WONDERFUL BIRTHDAY, Pam! Wishing U a Very Happy Birthday and may U enjoy this day in a very special way. Thank U 4 this opportunity on such a wonderful giveaway. wow thats a cute project...i will check out her blog. Such a cute project. I will have to go check out her blog. Hi Pam, Happy Birthday. I love this matchbook, too cute. HAPPY BIRTHDAY PAM!!! Enjoy your day!!! Happy Birthday!!! GREAT project - you're guest designer did a FABULOUS job!!! What a fun project! Thanks for sharing your birthday with us. What a GREAT idea! Love the mini album!! Love you more Pam!! Very Cute Project you made!! I am A Follower!! Thanks for a chance to win such awesome stuff. Happy birthday! I hopped over to check out the directions for the mini album and love her site. She is on my favorites list now. Have a fun week. Super cute project! TFS. An early happy birthday to ya too. Happy Birthday Pam!! I hope you have a great b-day week! Thanks for sharing your b-day with all of us. I Love Janis projects. She did a great job. I've never seen that before. Its so cute. Love the birthday mini,it is really a great project and gift.Happy Birthday Week. Happy Birthday enjoy your birthday week. Love the project. Hi Pam what a great way to celebrate your birthday, thank you. I hope you have a wonderful day on Friday. Wishing you a blessed birthday today and many, many more. I am a follower and love your blog. Your projects are an inspiration. Thanks for the opportunity to win. What a Fun way to Celebrate your Birthday Week. I have never seen a Matchbook Mini and I Love It!!! She did a Great Job. Have a wonderful birthday week! Love the birthday doggie! Very cute project! Have a great birthday week. Happy Birthday!! Thanks for the giveaway!! Happy Birthday week. Cute project. Happy Birthday Week. I love the mini album. Happy Birthday to you! Hope you have a most blessed day. What a cute mini. She did a super job on it. Hope you have a wonderful week and an awesome birthday Pam!!! Pam, hope your birthday week is a great one. Fantastic project! Thanks for the opportunity to win. Janis made such a cool album! She sent me over and passes along bday wishes! Thank you for sharing your bday with us. It is a very good thing to recognize oneself and celebrate your life! 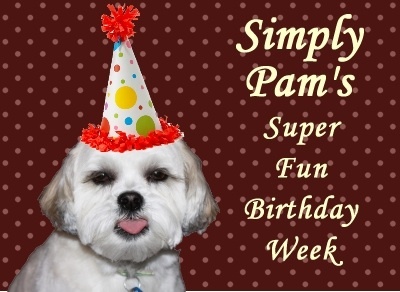 Happy Birthday Week Pam, I love your blog and I love watching your videos, thank you for the chance to win!!!! I am already a follower. Happy birthday Pam! Hope your week is filled with lots of birthday cake lol. Love birthday button!!! Great work on the mini Janis =) Keep up the great work! I am a huge fan Pam of both your blog and your videos! What a great idea to have a birthday week full of giveaways!! Turns out that your birthday is Friday and mine is Saturday!!! I am also having a birthday giveaway on Friday! Hope you can stop by! very neat project! Wonderful give a way!! What adorable projects! Thanks for sharing with us! I love the matchbook album. Never done one of those. It was adorable. Happy Birthday Week!I'm already a follower and enjoy your projects. Happy Birthday Pam! I love Janis' miini book. It is so cute. Thanks for sharing all of these goodies and congrats again. Happy Birthday! What a cute project. I've never seen an album like this one. Will have to check it out. ah, that is really adorable. Happy Birthday Week Pam! Love the great looking album that Janis made! Thanks for sharing your week with us and the chance to win a great prize! Love your blog. Thanks for the chance to win your blog candy. I love your giveaway, and Janis's project is so adorable. Happy Birthday and what an adorable button, your doggy is just the cutest. I am a follower now. Happy Birthday, Pam! I love your idea of celebrating a week of love and fun. Hope your Birthday Week was great, you put lots of smiles on my face. Thanks for the chance to win such great products. What a nice birthday celebration. Enjoy your week!--Pat N.
Wow, this is just to cute. I love it. What a fun mini, I love that hippo! !